You are at:Home»News»Blink 182 release new song ‘Bored To Death’ and announce new album and US tour! They have finally released their first single without guitars/vocalist Tom DeLonge, with Matt Skiba taking his place in the trio with Travis and Mark. The new single ‘Bored To Death‘ can be streamed above! The new album ‘California‘ will follow on July 1st, and you can check out the track listing below! Since their humble beginnings 24 years ago, when they started playing in a San Diego garage, BLINK-182 have sold over fifty million albums worldwide and played to audiences from Adelaide to Zurich, having become one of the defining rock bands of their generation. They combine high-energy dynamics with an artistic ambition that transcends any genre. Now with MATT SKIBA [of ALKALINE TRIO]joining the band as singer / guitarist, the group starts a new chapter. Skiba debuted with BLINK-182 in March 2015 with a live performance at the MusInk Tattoo and Music Festival. “It was the best they’ve sounded in over a decade,” the OC Weekly raved about the band’s set. Following the release of ‘Bored To Death’, the band have announced a summer headlining USA tour alongside A Day To Remember! 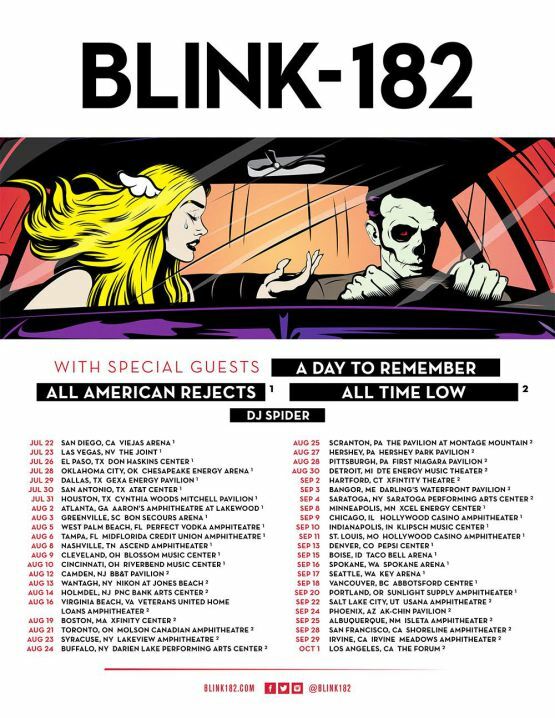 If that wasn’t good enough, All Time Low and the All-American Rejects will serve as rotating support. Tickets are on sale May 6. Check out a full list of dates and locations below. Be sure to let us know which stop(s) you plan on hitting up!